It was all about the fans Saturday night at Verizon Center as the Caps hosted Fan Appreciation Night. It was a chance to thank fans for their support throughout the season. All fans in attendance for the Caps vs. Arizona Coyotes match-up had the opportunity to win a variety of prizes throughout the in-game experience, and everyone received an awesome 2016-17 Capitals team poster. In honor of Fan Appreciation Night, the popular Chick-fil-A Spot the Cow game was played a little differently. All fans in one particular section were given a plain white envelope. On the count of three, led by in-game host Adam Kelsey, they all opened their envelopes. The one with a picture of the Chick-fil-A cow in it was the big winner. The fan holding the cow received a signed Justin Williams jersey. That’s one way to feel appreciated. Other fan favorites, such as the Shell Shuffle sponsored by The Green Turtle, The Roulette Wheel sponsored by Live! Casino & Hotel, and lots of fun giveaways –not to mention some exciting hockey action–made for an eventful evening at Verizon Center. 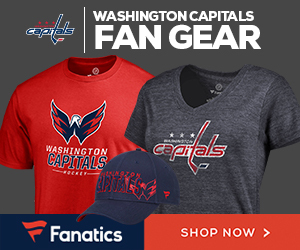 From Monday, March 20 through Friday, March 24, fans also had the opportunity to enter to win a variety of prizes through the #CapsFanWeek contest. The primary account holder information for all Season Ticket Members was automatically registered. Names were drawn every hour on the hour and posted to the website by 4 p.m. each day. Prizes included exclusive Capitals experiences, tickets to see some of today’s hottest artists as they come through Washington, D.C., team autographed items, and more. Just another way the Washington Capitals organization wanted to thank the fans for their continued loyalty and generosity. And, of course, the fans really appreciated two more points in the win column for the Caps as they downed the Coyotes 4-1. That’s 106 points! A young fan poses with the Red Rockers.